Quicker heat times so that you can get parts cleaner and lubed faster. In addition, the heater now features a lifetime warranty. The ultrasonic generator now boasts "constant power with sweep frequency" which means the cleaning frequency stays the same no matter the liquid level resulting in more efficient cleaning. Work baskets feature heavy-duty construction with more convenient drain position handles. 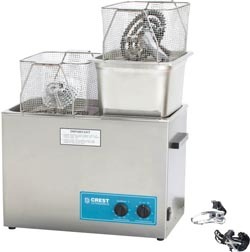 Plus, the baskets have been designed to swing down but still stay in an elevated position for more convenient draining of excess cleaning solution or lubricant. As with all Crest Bike Parts Clean and Lube Systems, the BC2600HT is an all-in-one system that eliminates contaminates in bicycle parts and lubes in 10 minutes. Just turn on the Crest ultrasonic cleaner and drop the parts into the special water-based, bio-degradable cleaner. The parts come out entirely clean and with a thin film of a light lube - more efficient and much faster than by hand. How does ultrasonic cleaning work? Through a generator built into the Crest system, voltage is produced which emits acoustic frequencies at 40,000 to 45,000 cycles per second. The high frequencies invoke sound waves into the cleaning solution which produce alternate zones of high and low pressures. During the low pressure cycle, tiny bubbles are formed which collapse in the high pressure of the next half cycle. As the bubbles collapse, they release shock waves that, by their scouring action, dislodge contaminate from the surface of bike parts. The end result is an ultra-clean bicycle part. "IBD's are going to be very happy with the new Crest BC2600HT," says Greg Infante, President of CMR Sales, Inc., Crest's exclusive distributor to the bicycle market. "The larger baskets and deeper tank mean more parts including the new style cranks can be cleaned at once, and with the new heater and upgraded ultrasonic generator it's an even faster clean." Completely Safe - chemicals are non-hazardous, biodegradable and emit little or no odor. Saves in labor costs by freeing up the users time to perform other tasks while the machine cleans. To see all of the Crest Bike Parts Clean and Lube Systems, stop by the Crest Ultrasonic booth #1213.